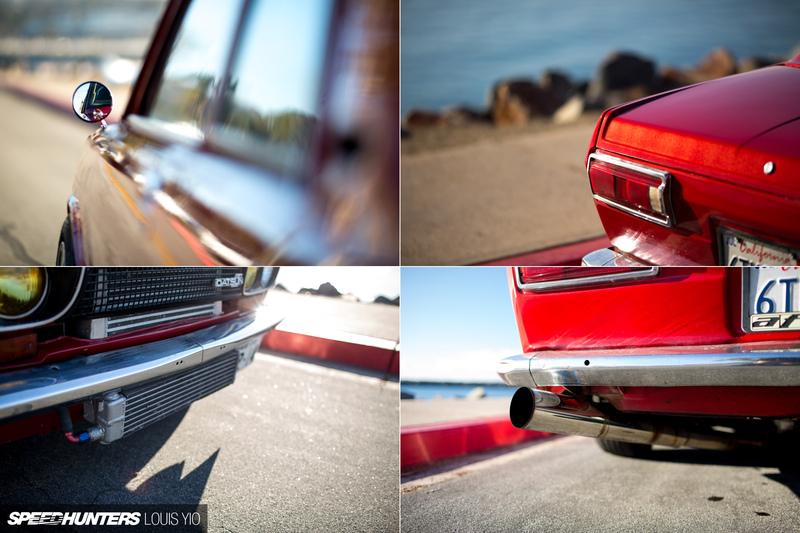 If you check Speedhunters on anything close to a regular basis, I’m sure you’ve noticed the unusually large number of Datsun and other classic Nissan feature car stories that we’ve been running over the last month or so. 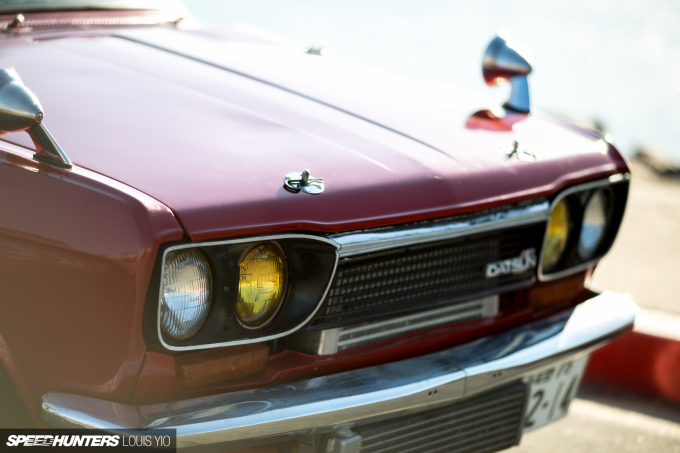 Whether it’s been a tidy Bluebird owned by one of Japan’s most well known 510 enthusiasts, a California-based 240Z equipped with OS Giken’s incredible twin cam cylinder head, or a couple of lovely Fairlady Zs from New Zealand, the Datsun content has been hot and heavy of late. I can also tell you that there’s no master plan at work here; there was no strategy to go crazy on the Datsuns to kick off the year. We simply like sharing cool cars, and it just happens that we’ve been pointing our cameras at a lot of sweet old school Nissans lately. It seems like you guys are okay with that too. 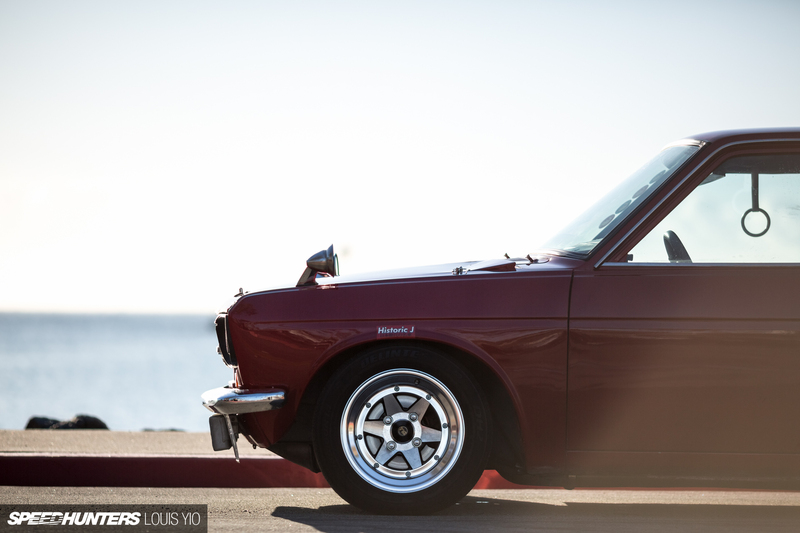 After all, there’s just something universally cool about a fixed up Datsun, especially when it’s built to the level of the cars seen here on Speedhunters over the last several weeks. And now it’s time to add one more to the mix – a beautiful little ’72 510 built by Raul Toledo of San Diego. 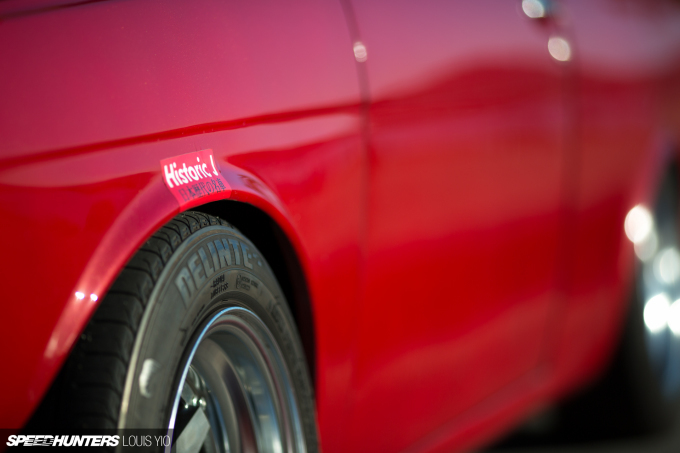 This is the car that claimed our FeatureThis award at last fall’s Offset Kings show at Irwindale Speedway. 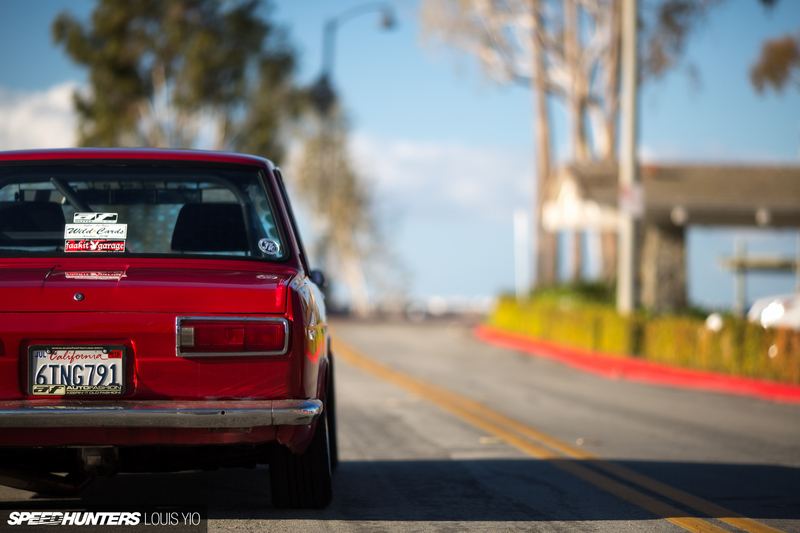 It was about six years ago when Raul decided he wanted to build a 510, and after searching high and low for a decent example, he found the ’72 for sale in the San Francisco Bay Area. It had a carbureted VG30 V6 swap done by a previous owner, which would power the car down the state of California on the long trip back home to San Diego. While it made for decent upgrade from stock, the V6 wasn’t to last though. 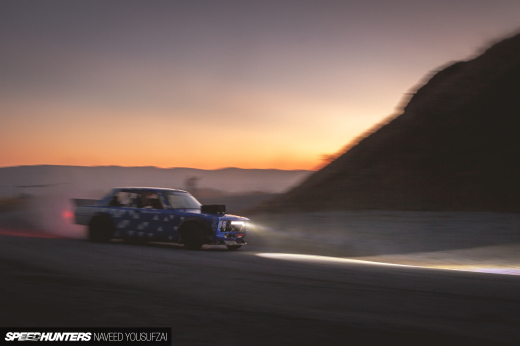 The Datsun suffered an unfortunate engine fire, and while the overall damage to the car wasn’t extensive, it was enough to say goodbye to the old VG motor and start planning a new engine setup. Like most people who have project cars, Raul spent a lot of time researching online. He browsed sites like The510Realm and Ratsun.net, asking questions and taking inspiration from other 510 builds that were out there. 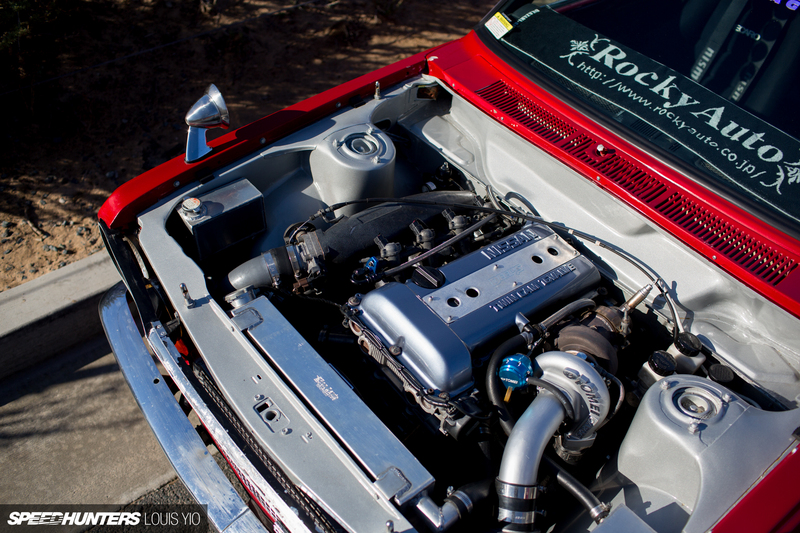 He knew he wanted more power and also wanted to stay true to the 510’s family heritage, so naturally he arrived at the idea of an SR20DET. Not only is the turbo four-cylinder a popular swap choice, it’s also an engine that feels like it was tailor-made for use in an old 510, with enough potential to suit just about any horsepower goal. With help from the crew at Deep’s Garage of San Diego, Raul was able to source an SR setup that would not only deliver improved power and reliability, but also leave room for future upgrades. And speaking of upgrades, the SR is already packing some pretty solid go-fast parts. There are CP forged pistons, an ISR intake manifold and an upgraded fuel system to cover the basics. 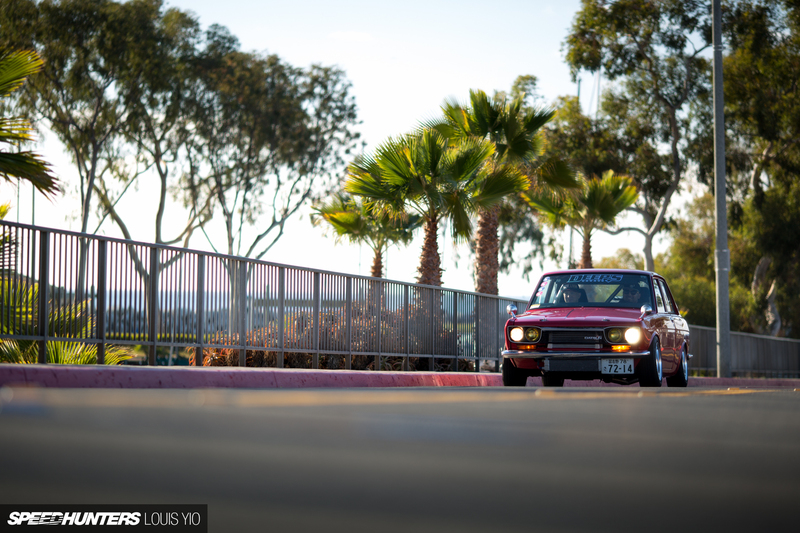 Boost comes via a Tomei M7960 turbo upgrade kit, which significantly improves power output but also retains driveability for road trips or just when Raul is out cruising the streets of San Diego. 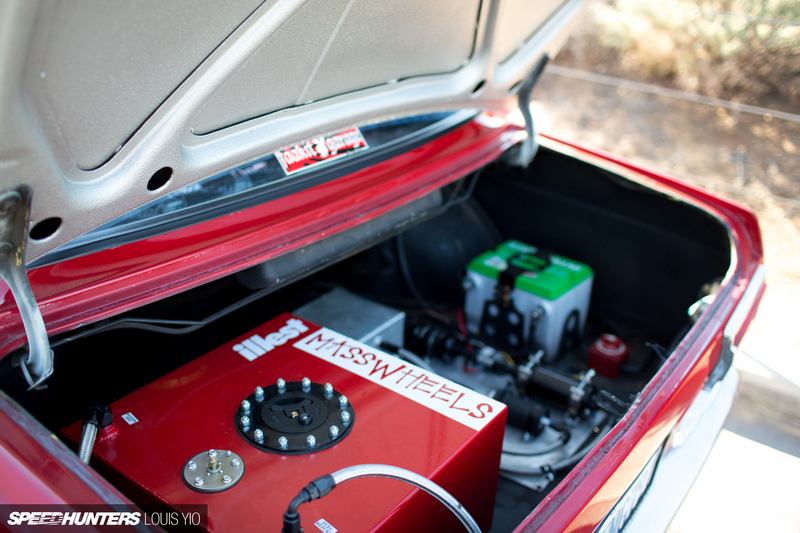 There’s a 10-gallon RCI fuel cell mounted in the trunk to replace the factory Datsun gas tank, and the battery has also been relocated to the rear to improve weight distribution. The gearbox is 5-speed manual of course, and an R160 differential with a viscous limited slip unit helps deliver the turbocharged SR power to the ground. 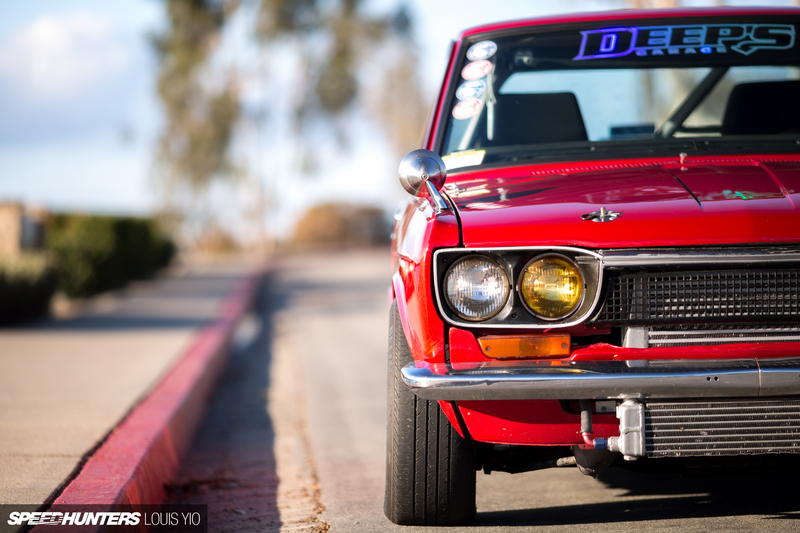 Other improvements to the 44-year-old Datsun include a complete handling kit from Datsport in Australia, plus a set of custom-built adjustable coilovers all around. 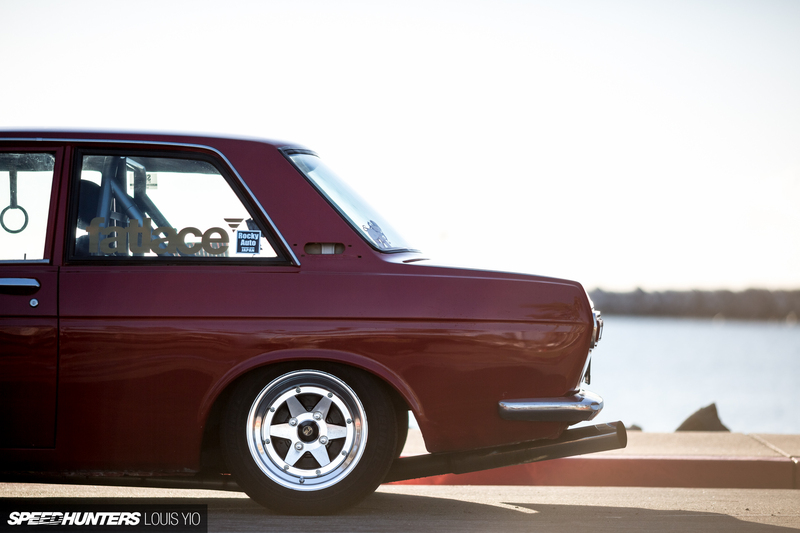 Not wanting to detract from the simple, classic look that drew him to the 510 in the first place, Raul has kept exterior changes to a minimum. 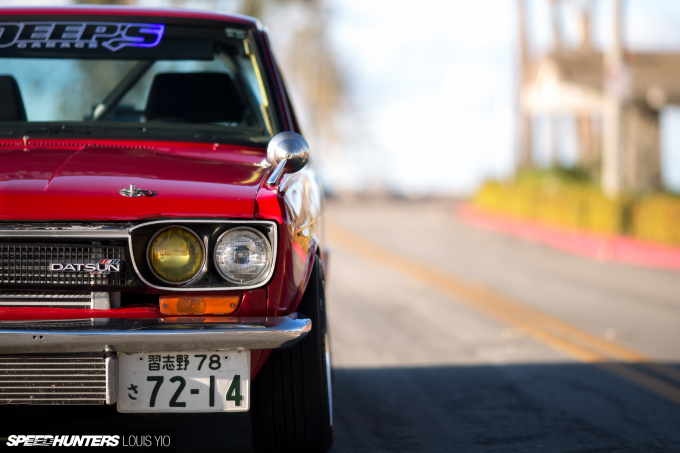 The key difference is up front where the stock US-market grille has been replaced with one from a JDM Nissan Bluebird. Other cosmetic touches include deleted side-markers, a pair of Nissan fender mirrors, an externally-mounted Mazda RX-7 oil cooler and a coat of Mazda Velocity Red paint. 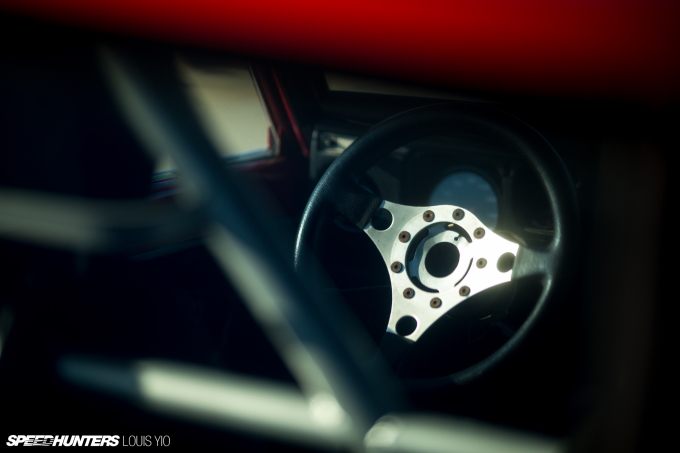 As for the wheels, they’re classic SSR Longchamp XR4s measuring 14×7-inch with 0-offset at each corner. In a stroke of luck, Raul found the old school wheels brand new in their original boxes. 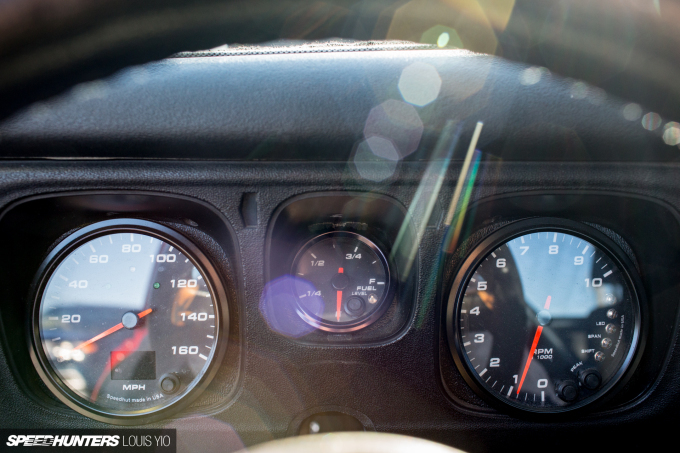 Inside the car, the original 510 dashboard has been restored and also fitted with a custom triple-gauge instrument setup. A pair of old school Recaro LSC buckets accommodate the driver and a passenger, while a half roll-cage is fitted for safety and stiffness. Let’s not forget two of the most important interior additions either – autographs from Watanabe-san of Rocky Auto and Inoue-san of Star Road in Japan. 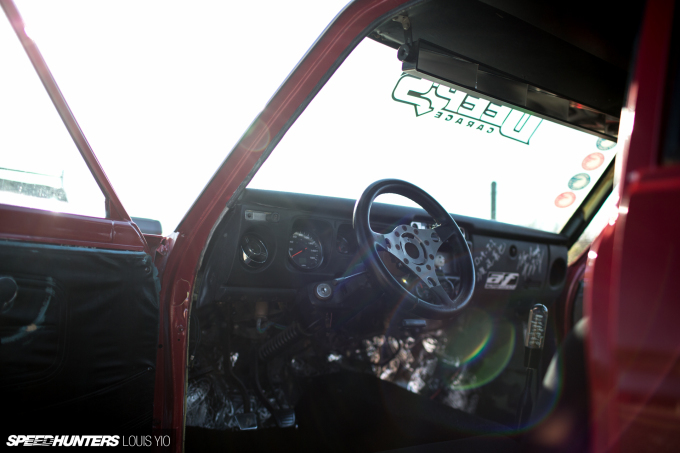 Raul tells me he plans on keeping this car for a long time, and while he’s not exactly sure of his long-term goals for the Datsun he is currently looking at additional engine upgrades to hit the 400whp mark while still running on pump gas. 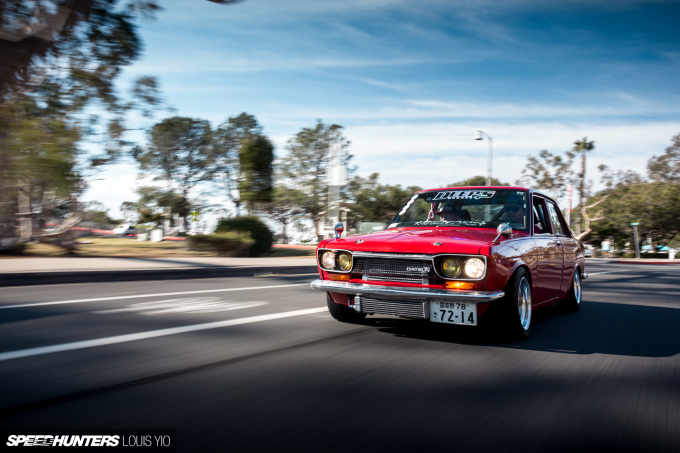 We’ve seen some amazing Datsuns here on Speedhunters lately, and Raul’s 510 is the perfect way to close out a month of features that should have all of us scheming for a way to put one of these Japanese classics in our own garages. 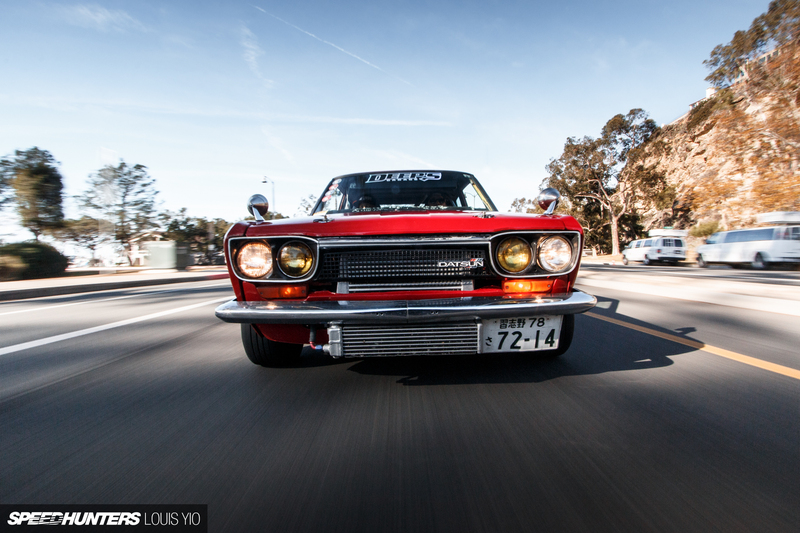 From America to Japan to New Zealand and back – damn it feels good to be in a Datsun. @Dom Oh Dom - I loved when you said, "I’m a boy who appreciates a good body, regardless of the make.” Speaking of cringeworthy Dom... what's with the glory hole on the C pillar of this whip? Also please send my an autographed tank top. Thanks XOXOXOXOX!! Love this car, these Datsun articles always send me to search the classifieds! What's the idea with fuel cells in cars like these? They get mounted further back and higher than the stock location, so it's something I've never understood the benefit... Can anyone enlighten me? Great looking car, although the tire pressure looks a bit low in various pictures. Some slight buldging at the bottom, might want to inform the owner. Great article! JonathanW I'm not too sure about 510's, but bmw 02's reek of gasoline. 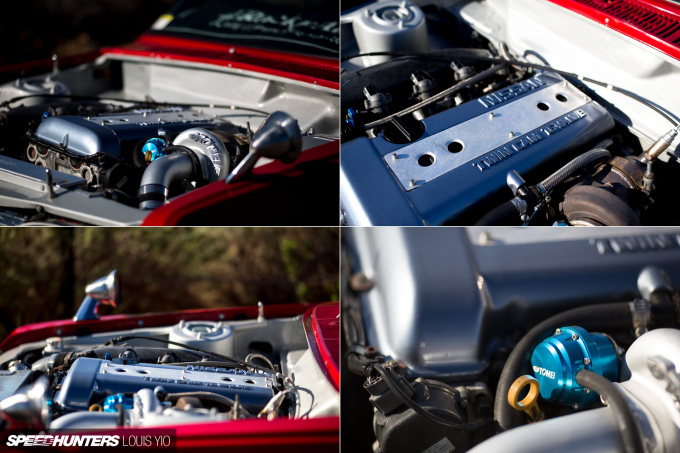 On these old cars, I think sometimes a complete fuel system overhaul is necessary so it just makes sense to upgrade. A lot safer too, if done right. There's no such thing as too many Datsun features. JonathanW Original cars of this age pretty much all ran on carburetors (low pressure/volume). The original fuel tank, fuel lines, pump, and other bits would never be up to the task of safely supplying a much more powerful fuel injected engine. You need things like a baffled tank, electric pumps, high pressure lines etc. It just makes sense to redo the entire fuel system at that point, and use a fuel cell properly suited for the engine it supplies. 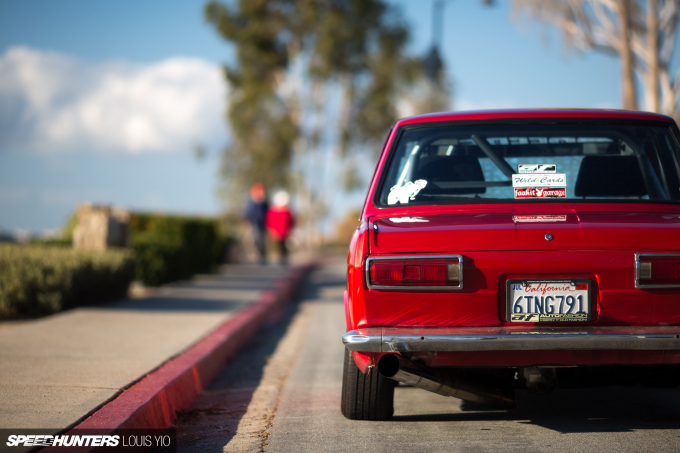 Great build, though I'm a bit biased to Datsun features lol. 400whp goal? Time for some wider wheels! 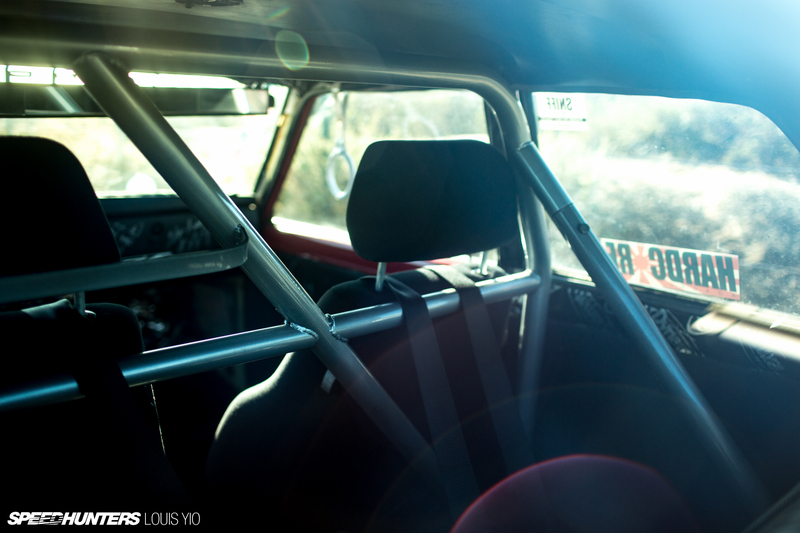 @Jonathanw I did a fuel for this car due to thexhaust fact the original was completely shot and leaking. It's a better option than rating to find a perfect condition tank. 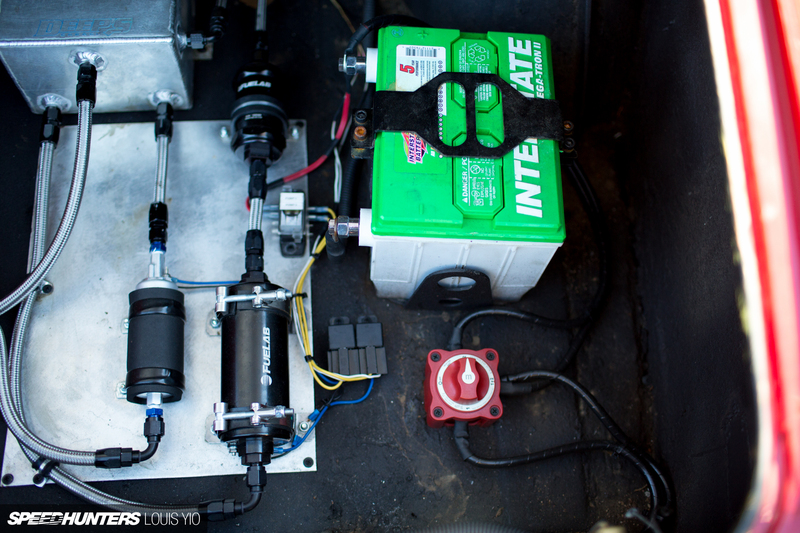 Also with fuel cells I run a fuel surge tank which will always assure proper supply of fuel to the secondary pump. You can see it in the 3Rd to last photo. Check out cars on board you tube page. how did i miss this! 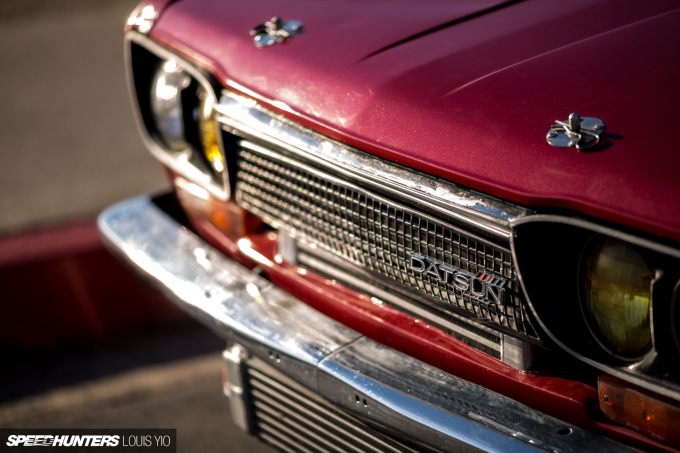 LOVE the Datsun content SH! Being in SoCal I'm surprised you guys haven't featured anything from TSR! Cool, thanks for the answer, and the other guys for their contributions too. 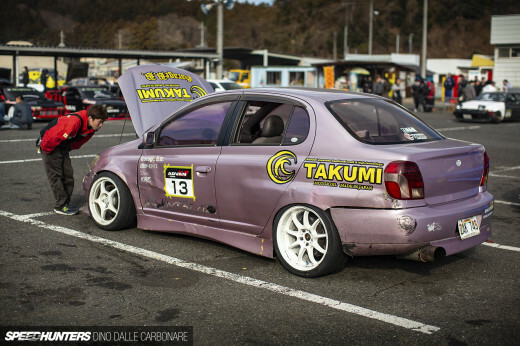 I've never modified a car that has anything other than FI and a plastic tank, so a bit of a different ball game! JonathanW We are building a 510 SR20DET street car and I am considering a 8-10gal fuel cell weight and fuel delivery capabilities. otherwise a new fitting has to be welded on the stock tank, dangerous and time. The fuel cell will allow battery and fuel to far back for weight distribution, I have not calked it out but I think its sound.